Gently rinse and pat dry strawberries. Place on a cookie sheet lined with paper towels. Gently insert the plastic tip of the syringe into the underside of the strawberry, slowly depressing the stopper to inject the Amaretto. Watch carefully - you will see the strawberry puff up as the liquor fills it. Pat dry any excess Amaretto and place on a cookie sheet lined with paper towels. Using a microwave safe container, and working with one dish at a time, place chocolate in microwave at medium power for 1- 1 1/2 minutes. Remove and stir. If not melted, return to microwave and repeat heating step, stirring every 30 seconds, as scorching can occur. When small lumps remain, remove and continue to stir to complete melting. 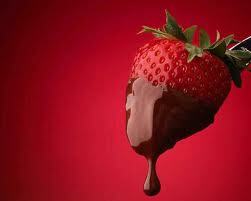 Carefully hold a strawberry by the stem and dip/swirl the berry in the chocolate. Repeat until all strawberries have been dipped. Place cookie sheet in refrigerator until chocolate is set. Serve with whatever your heart desires. Find this great Recipe on What's Cooking in your World? Instructions Place in crushed ice into large container or jug. 1. Divide cream into three individual pans. Add mint into one pan, chili into the second pan, and espresso into the third pan. Slowly warm each pan to a near simmer and remove from heat, allowing flavor to infuse for 15 minutes. 2. Place dark chocolate in a small bowl and set bowl over a small saucepan of barely simmering water. Stir constantly until chocolate melts. 3. Remove pan from the heat and divide chocolate into three small pots. 4. 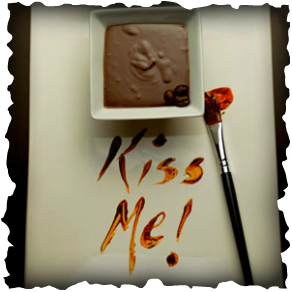 Return pans of cream to heat and, once hot, strain each pan of cream into one chocolate pot, creating three separate flavored chocolate body paints. 5. Using 3 small brushes and your imagination, paint away! A modified Cosmopolitan, this cocktail also calls for raspberry-flavored vodka and sweet black-raspberry liqueur. Try Something New on Date Night! Make Ice Cream Cocktails together!